We take a break at our Basic Algebra Theorems proof as I introduce reflection. Although this is not about mathematical proof, we will use this concept in proving many theorems later. In mathematics, we also talk about reflection. 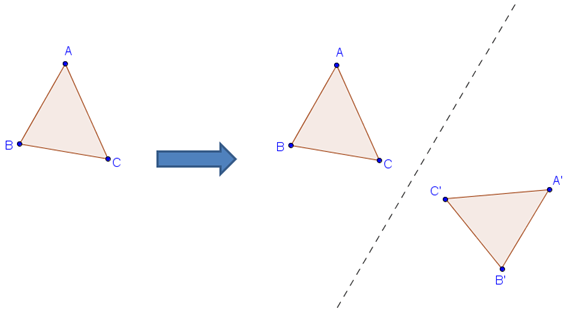 If we want to reflect the triangle on the left in the figure above, we just fold somewhere and then trace the triangle. We call triangle ABC (the original image) the pre-image of the reflection and we call A’B’C’ the image. We call the fold (the dashed line) the line of reflection. The image and pre-image of a reflected object have some interesting mathematical properties. First, the image and the pre-image are of the same size and shape, so they are congruent. Secondly, the line segment connecting the corresponding parts of the image and the pre-image is perpendicular to the line of reflection. Lastly, the distance from the line of reflection of the corresponding parts of the image and pre-image is the same. 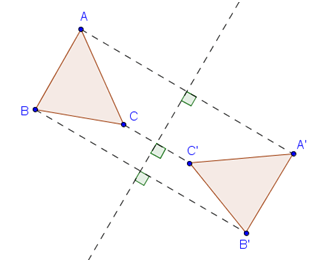 For example, the distance of C and C’ from the line of reflection is the same. In future mathematical proofs, we use the reflection notation. Suppose that P’ is a reflection of P over a line, we write r(P) = P’. We also read this “The reflection image of P is P’. If a line has a name, say m, and P’ is a reflection of P over line m, we write rm(P) = P’. 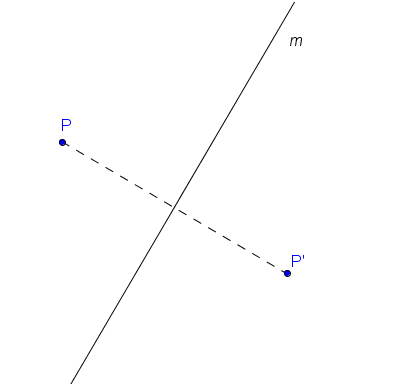 We also read this notation “The reflection image of P over line m is P’. Reflection and its twin symmetry, is one of the most beautiful concepts in mathematics. We will appreciate this concept in proving many theorems in the future.